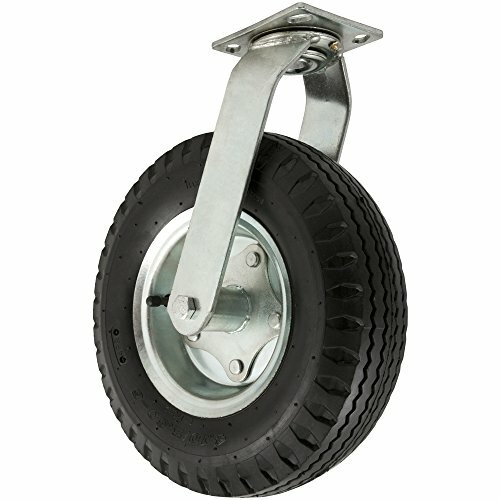 Pneumatic casters feature air filled rubber wheels. They are designed for low speed, manually moved applications. Pneumatic wheels provide a cushioned ride, shock absorption and quiet operation. Casters with pneumatic wheels are usually the best choice for use outdoors over rough surfaces (i.e. gravel) or on grass. The top mounting plate for this caster is 4.52” by 3.94”. The bolt pattern, which is the distance between each installed bolt, is 3.30” by 2.91”. The diameter of each bolt hole is 0.432”. When this caster is installed, it adds an additional 15.24” of overall height to the item you are attaching it to. Top Mounting Plate: 4.52"x3.94" Bolt Pattern: 3.30"x2.91" Bolt Hole: 0.432" Overall Height: 15.24"